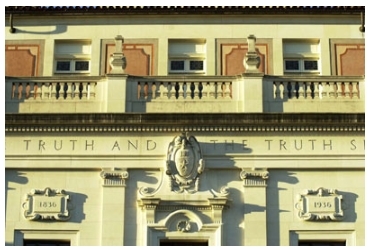 The Main Building at the University of Texas, Austin with the inscription “Ye shall know the Truth and the Truth shall make you free.” Photo by Marsha Miller. This week the Manifold Greatness exhibition is once again on the road, traveling to the Harry Ransom Center at the University of Texas, Austin; Hope College in Holland, MI; Mid-Columbia Library District, in Kennewick, WA ; and Mobile Public Library in Mobile, AL. Danielle Brune Sigler of the Harry Ransom Center is co-curator of “The King James Bible: Its History and Influence,” a variation of the Manifold Greatness exhibition. This week, she blogs on common phrases from the King James Bible and how the book has influenced contemporary culture, from the speeches of Dr. Martin Luther King, Jr. to Robert De Niro’s tattoos in the film Cape Fear. “The King James translation has left an indelible mark on the cultural landscape of English-speaking people throughout the world,” she writes. Read her complete blog post here. 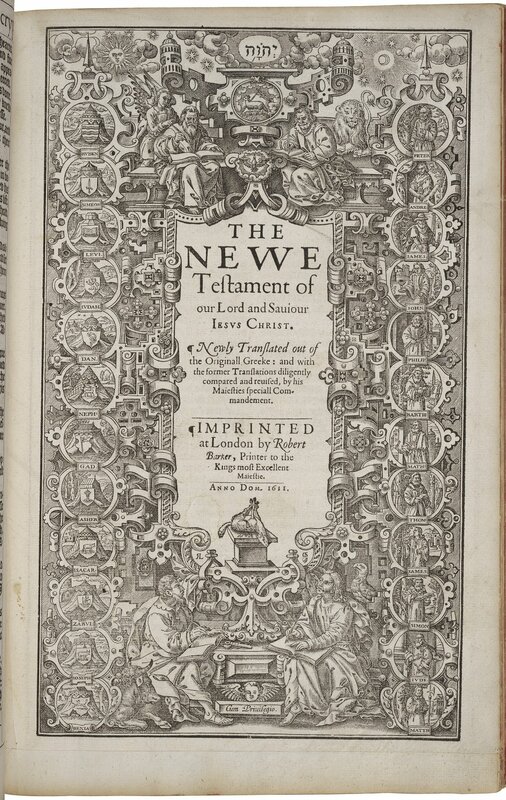 Title page of the first edition of the King James Bible. The Holy Bible, conteyning the Old Testament, and the New. London, 1611. Folger Shakespeare Library. What does the Good Book have to say about love? Plenty. Here is a selection of several well-known verses from the King James Bible on love, just in time for Valentine’s Day. For the King James Bible translators, “charity” meant benevolent, kind-hearted feelings towards one’s fellow human beings. “Most people are bothered by these passages of Scripture they do not understand, but the passages that bother me are those I do understand.” –Mark Twain. 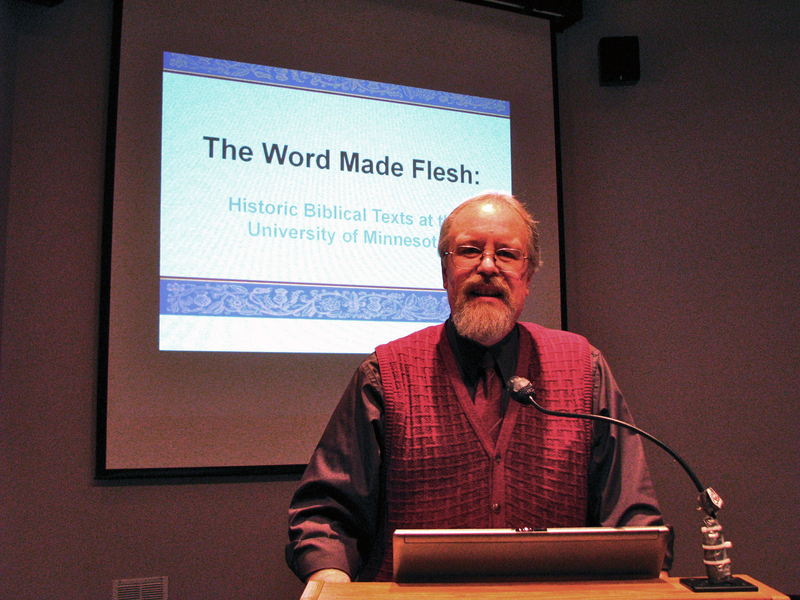 The poet Andrew Hudgins has identified the King James Bible as the most important work in Southern literature, and the crowd that gathered at William Carey University for the panel discussion, “Living in the Belt with the Good Book,” would agree. William Carey faculty members Dr. Tom Richardson, Dr. Lorie Watkins Fulton, and Dr. Allison Chestnut led a wide-ranging discussion of Biblical influences on Southern literature, and in particular, the writings of Mark Twain, William Faulkner, and Eudora Welty. Richardson, chair of the Department of Language and Literature at William Carey, opened the discussion with reflections on Twain’s complicated, irreverent, and iconoclastic views on the Bible and religion. 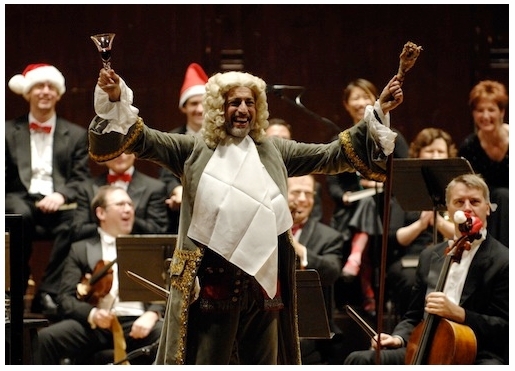 “It is full of interest. 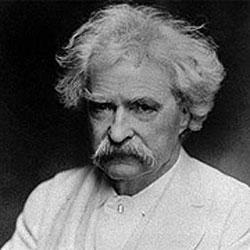 It has noble poetry in it; and some clever fables; and some blood-drenched history; and some good morals; and a wealth of obscenity; and upwards of a thousand lies.”—Twain’s Letters from the Earth, published posthumously in 1962. Fulton, author of William Faulkner, Gavin Stevens, and the Cavalier Tradition (Peter Lang, 2011), recounted the story of Faulkner’s grandfather, who demanded that each grandchild recite a verse from the King James Bible each morning before breakfast. No Bible verse, no breakfast. Fulton surmised that perhaps this early training directly inspired the many Biblical allusions in Faulkner’s novels. The influence of parable on the short stories of Eudora Welty was the subject of Chestnut’s presentation. Chestnut argued that Welty’s stories imitate both the style and structure of Biblical parables. The “afterlife” of the King James Bible is clearly on display in the works of these great writers that we Southerners claim as our own. A timeline of the King James Bible’s literary influences is viewable on the Manifold Greatness website. 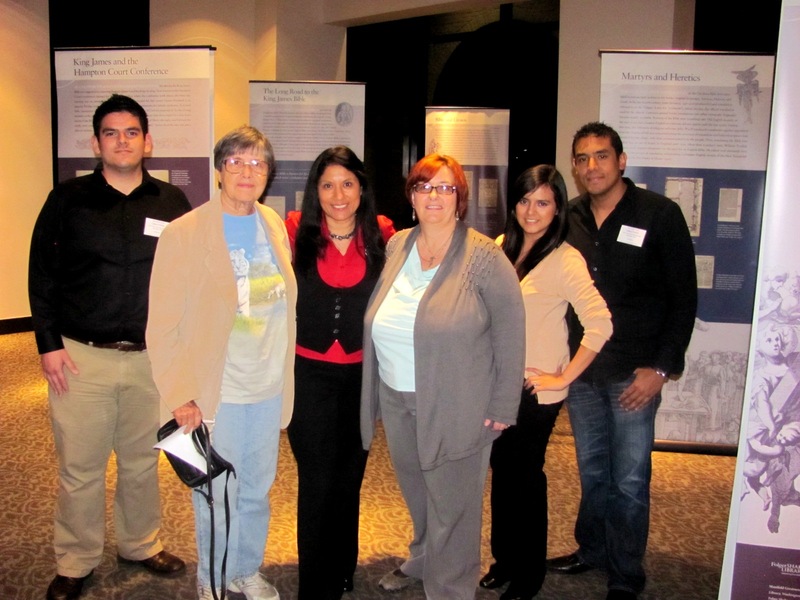 Staff with the Manifold Greatness traveling panels at the University of Texas, Brownsville. Courtesy of the University of Texas at Brownsville. It’s been an outstanding experience hosting Manifold Greatness: The Creation and Afterlife of the King James Bible exhibit here at the University of Texas at Brownsville (UTB) since January. 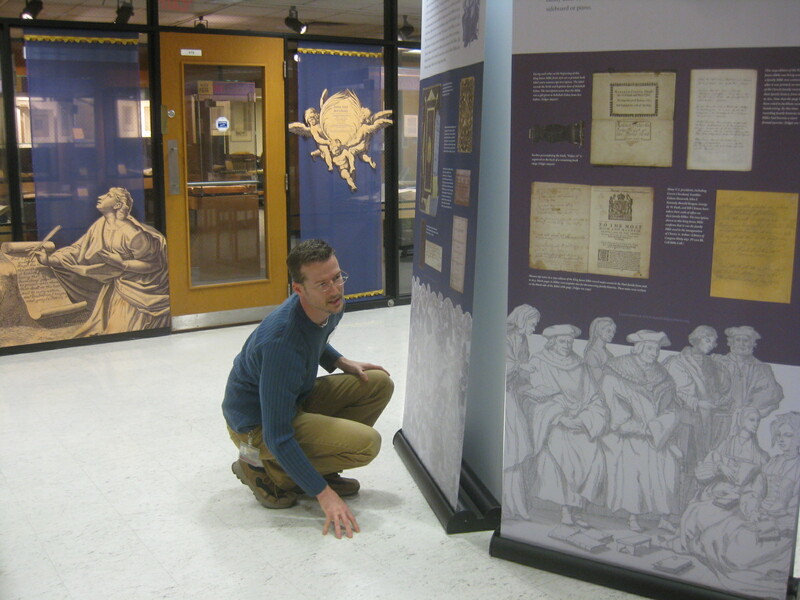 UTB and the Harry Ransom Center at the University of Texas, Austin are the only institutions in the state of Texas where the exhibit can be viewed. We’ve enjoyed excellent turnout for each of the special presentations held in conjunction with the exhibit. Our opening night presentation was delivered by UTB English Department faculty member Dr. Mimosa Stehenson, and focused on Nathaniel Hawthorne’s use of the Bible. To date, three of the five scheduled presentations have taken place, with guests visiting from across the state and the border stopping by to learn more. “It’s extraordinary to have an exhibit like Manifold Greatness here in the Rio Grande Valley, and the Academic Libraries of the UTB are pleased to help play a role in educating our community about the historic anniversary of this great book,” said Annabel Treviño, University Librarian for UTB. Our area’s population truly seems to hold their faith dearly and we’re not always as well-served as other parts of the nation with world-class exhibits like Manifold Greatness. Seeing so many guests take part in this intuitive and educational exhibit leave with a smile on their face or a desire to learn more from the Manifold Greatness website is really inspiring. Millie Hernandez is the Special Events Coordinator for the Academic Libraries at the University of Texas at Brownsville. The Arnulfo L. Oliveira Library is hosting the Manifold Greatness exhibit and related presentations through February 16th. Manifold Greatness: The Creation and Afterlife of the King James Bible is currently on view at William Carey University in Hattiesburg, MS; the University of Minnesota in Minneapolis/St.Paul; and the University of Texas at Brownsville in Brownsville, TX. Later this month, the exhibition opens at the Harry Ransom Center at the University of Texas at Austin. 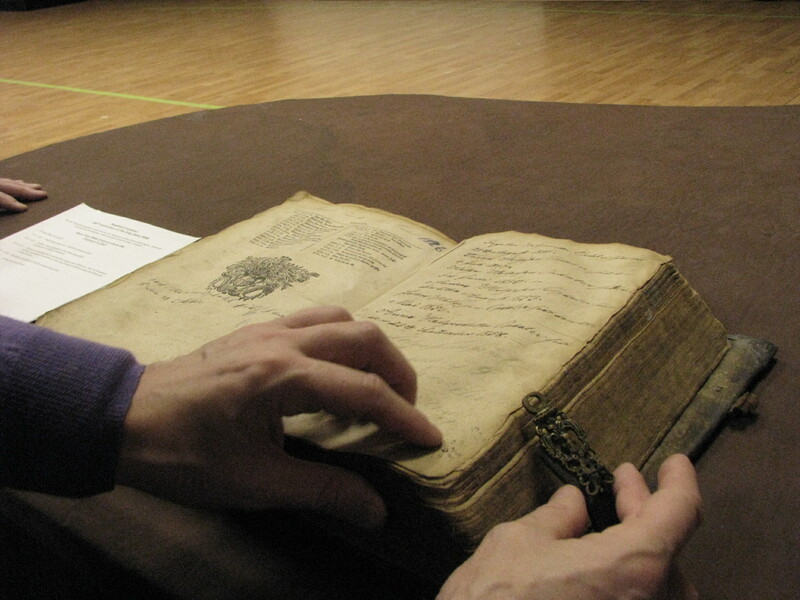 A family Bible owned by Tim Strand, published in 1684 in Copenhagen. Photo by Susan Gangl. Both William Carey University and the University of Minnesota have shared photos from events related to the Manifold Greatness exhibition. The University of Minnesota hosted two events over the weekend, including a “Manifold Greatness Colloquium” on Friday. 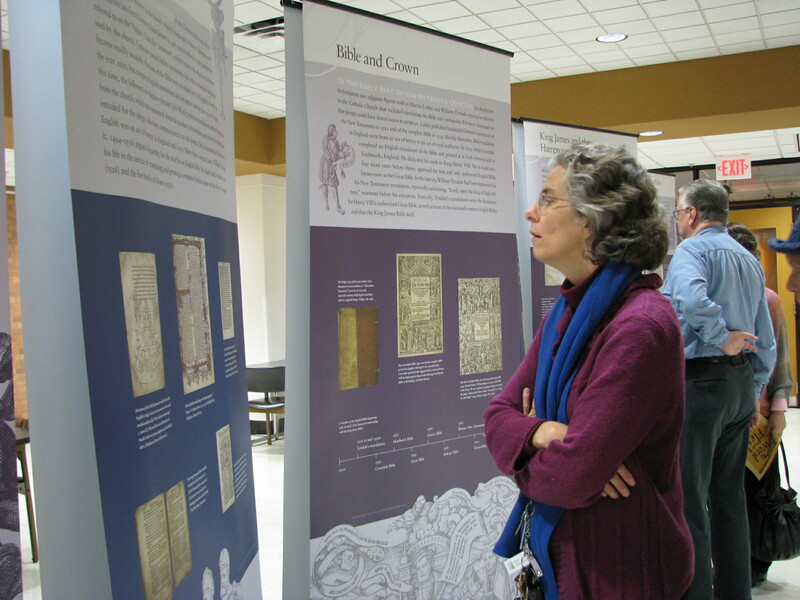 Over 70 people gathered to see the traveling exhibit, as well as a local exhibition entitled “The Word Made Flesh” which showcased rare Bibles. The colloquium included presentations by scholars from the University of Minnesota, Bethel University and Luther Seminary, as well as a reception with music, tea, and scones! On February 5, a “Share Your Bible” workshop for adults and children encouraged participants to share family Bibles and memories. William Carey University is also showcasing family Bibles, and has photographs of many of these heirlooms on display along with the Manifold Greatness traveling exhibition. To view photos of events at William Carey University and the University of Minnesota, please visit Flickr. Amy Arden is a communications associate at the Folger Shakespeare Library. The Folger partnered with the Bodleian Library, University of Oxford, and the Harry Ransom Center at the University of Texas at Austin, to produce Manifold Greatness: The Creation and Afterlife of the King James Bible.